Stink has been in the Polliwog swim class for ever and he still can't bear to put his face in the water. But then something weird happens: Stink starts to see frogs everywhere - in the changing room, in his boot, in the bathtub. And when a freaky blue frog licks his arm, his froggy senses start tingling! Suddenly, Stink can't wait to play in the rain and mud. He's a whiz at identifying frog calls. And he has become very interested in the local frog population. 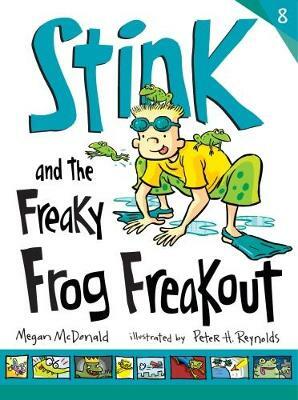 Could it be that Stink is turning into the Amazing Frog-Boy? Ideal for children learning about the environment and conservation, the graphic novel sections also make this great for comic-book fans.